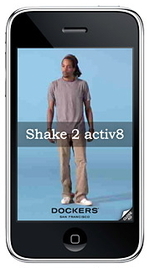 Created by Razorfish for Dockers, which believes it's the first-ever brand to launch a motion-sensitive ad that makes use of iPhone's accelerometer feature. In keeping with its Casual 30-Something Male demo, the company's shifting more of its budget to digital. If you're not figuring out how to move to digital these days, you're not going to be around much longer. Thanks, Angela. We (Medialets) provided all the technology behind this. We can also combine multiple actions/clickthroughs in a single ad so that an ad can combine branding, customer acquisition, permission-based data capture, etc. all for the price of a single buy. Always happy to chat about this with anyone interested.